People cheer at the Republic Square in Yerevan, May 8, 2018. 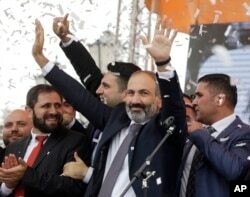 As tens of thousands gathered in the central square of Armenia's capital to celebrate Tuesday's 59-42 vote to make Nikol Pashinyan prime minister, supporters of the longtime opposition figure called their political triumph the first step in a much longer journey. Tuesday's decision followed weeks of largely peaceful protests against corruption and poor governance that came after former President Serzh Sargsyan became prime minister in April, a move that critics called a manipulation of the country's constitution to extend his hold on power. Just last week, Armenia's ruling Republican Party, which holds a majority in parliament, blocked Pashinyan's initial bid to become prime minister, prompting further protests and city-wide blockades and strikes. Republican Party leaders then agreed to grant Pashinyan the minimum number of votes required to secure the office with full support of Pashinyan's minority opposition coalition. Newly elected Prime Minister of Armenia Nikol Pashinyan addresses the crowd in Republic Square in Yerevan, Armenia, May 8, 2018. In sharp contrast with the jubilance that erupted in Yerevan's central Republic Square after Pashinyan's election was confirmed, the atmosphere inside the national assembly was dour, said Gevorg Gorgisyan, a legislator aligned with Pashinyan's Yelk, or "Way Out," alliance. "Republican Party members were not in a celebratory mood, and it reflected on everyone," Gorgisyan told VOA's Armenian Service. Pashinyan, a one-time political prisoner whose years of street activism earned him the ire of establishment officials and legislators, had crusaded against entrenched corruption and oligarchical influence for decades. "Our country and our people needed this," Gorgisyan told VOA. 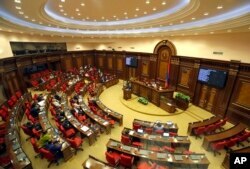 "Now we have a chance to create a new, happy, independent and democratic Armenia. ... The revolution is starting, it is not over and big changes are to come." Shortly after the vote, Russian President Vladimir Putin telegrammed Pashinyan to say that Moscow is depending on him to "aid the further strengthening of bilateral, allied relations between our countries." Russia, which has strong strategic interests in Armenia, including a military base, has been watching the country's political turmoil closely. In a region dominated by "strongman" politics, the grass-roots demonstrations — which protest leaders had been careful not to paint as pro-Western or anti-Russian — are focused on a domestic agenda led by honest elections. In weeks leading up to the vote, Pashinyan repeatedly said that he would not seek to change Armenia's cooperation with Russia. Also within hours of the vote, however, Armen Ashotyan, vice president of the Republican Party and head of the parliamentary foreign affairs committee, said the party now considers itself the opposition and will refuse to cooperate with the new government. FILE - Opposition lawmaker Nikol Pashinyan speaks during a parliament session to choose a prime minister in Yerevan, May 1, 2018. "We do not consider it expedient to cooperate with the new government; it would be hypocritical to consider the issue of our participation in the new government,'' he said in a prepared statement. "We will find a place for ourselves. And this place is not in power, but in the opposition." Pashinyan now has five days to propose cabinet members and just over two weeks to file a government program for parliamentary approval. While the new leader has vowed to establish a government of "national accord," parliamentary failure to approve a program within 20 days of his ascension to office requires dissolution of parliament and a call for early general elections. Although majority Republicans may resist any plan advanced by Pashinyan, some observers — such as former legislator Armen Martirosyan of the Heritage party, which is not represented in parliament — say all Armenians, regardless of party affiliation, should appreciate that non-violent political changes are under way. "I am in a very good mood, I am happy that my people's fight ended in celebrations!" Martirosyan said. "We did not have a leader who was popular among people for a long time, now we have one. I congratulate the people of Armenian and Nikol Pashinyan in his new role. I expect productive changes and reforms." For Syrian refugees living in Armenia in particular, Tuesday's peaceful outcome was a welcome change from the broader geopolitics of the region. "We were very nervous at the beginning, but now we are happy and celebrating with Armenia," said Sevan Kilegyan, who crossed the border into Armenia after her native Syria was plunged into a bloody and grinding civil war. "We came to Armenia from Syria. Now, our husbands are working outside of Armenia to be able to provide for our families. We want them to be able to come back and work here and be next to us," she told VOA. "I am a Syrian Armenian, and I am visiting my sisters," said Suzi Nshanyan, a refugee who had just traveled to Yerevan from Germany. "I see hope and happiness in people's faces that I have not seen before," she said. This story originated from VOA's Armenian Service. Some information for this report was provided by AP.